U.S. stocks look set for a rebound Tuesday after Russian President Vladimir Putin eased some of the tensions in the Ukraine crisis. U.S. stock futures were pointing to a higher open Tuesday morning as global stocks recovered. In comments to reporters in Moscow, Putin said Russia has no intention of annexing Ukraine's Crimea region, where the Russians have military bases. Earlier in the day, he ordered some troops to return from military exercises at the Ukrainian border. But Putin also called last month's ouster of Ukraine president Viktor Vanukovych, who is sympathetic to Moscow, an "anti-constitutional" coup and reserved the right to use military force. "Confidence in equity markets has been restored as the stand off between Ukraine and Russia is no longer on red alert," wrote IG market analyst David Madden in a market report. But he added that Tuesday's rally-in-the-making is "fragile." "We are not out of the woods yet," he wrote. "The drop in equity markets yesterday, and correction back today, highlights how volatile an issue this is." Investors are closely watching developments in Ukraine as they worry that further escalating tensions and military action could wreak havoc on commodities, stocks and currencies. But experts say the political turmoil won't derail the bull market. The latest reading from the CNNMoney Fear & Greed index shows investors are in 'neutral' mode. On the economic front, President Obama will release his fiscal year 2015 budget proposal Tuesday. The budget will include a handful of proposals to help low- and middle-income families. In corporate news, Radio Shack (RSH) shares tumbled more than 20% after the electronics retailer reported in its earnings statement that it is closing about 1,100 stores, or about 20% of its total, amid plunging same-store sales. Gun maker Smith & Wesson (SWHC) will report after the close. Stocks around the world closed lower Monday as tensions increased between Russia and Ukraine. The Dow Jones industrial average ended with a 154 point loss, or nearly 1%, breaking three days of gains. The S&P 500 and Nasdaq both fell about 0.7%. 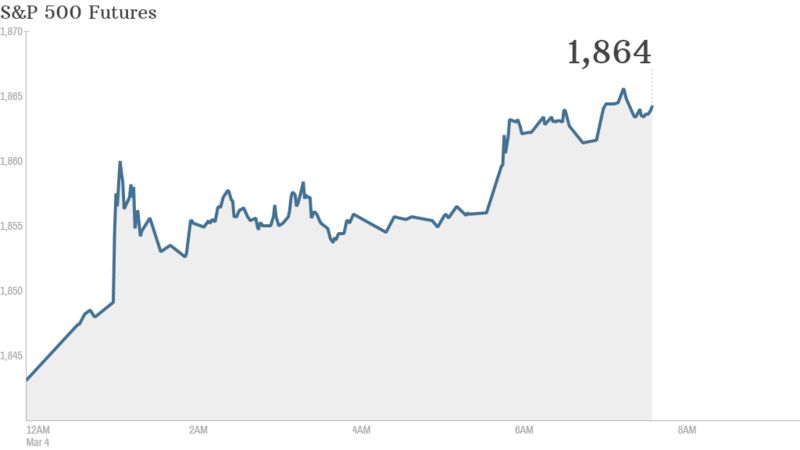 Global stock markets were regaining lost ground Tuesday. Russia's main stock market index surged by over 5% after suffering a sharp 11% fall in the previous trading session. Europe's main markets were also popping up in early trading, with the DAX in Frankfurt and the CAC 40 in Paris rising by more than 2%. In Asia, most stocks closed with gains -- Hong Kong's Hang Seng index rose 0.7% and Japan's Nikkei added 0.5%. China's benchmark Shanghai Composite moved the other way, sliding 0.2%.